Her hand bloodied and blistered, she bandages it up, ties it to her racket and keeps going. Giving up isn’t an option. This is her moment! Her chance! Her dream! This is Aim for the Ace!. Hiromi Oka has spent her youth idolising Reika Ryūzaki, known otherwise as the beautiful Madame Butterfly (Ochōfujin,) a formidable, undefeated tennis player. But Hiromi has trained hard for this match, sacrificed her love, even, to reach this point, and now she’s here, a little bit of blood and pain isn’t like to stop her. There’s a point in this climax when the tennis transcends a match about winning and losing: when a battle is fought with such honesty and determination, it becomes less about the result and more about the moment. Time slows, minds become clear and nothing else matters. It’s as tranquil an experience as it is rare, and it’s the reason you’ll often find retired professionals struggling to cope outside their sports of choice. That brief, fleeting glimpse of paradise. It’s hard to forget. I think, at least, that’s what Hiromi and Reika’s coach is referring to with the line, “Now, this match and this court belong to those who are risking their youths.” This is the game of their lives, and one that not even the setting sun can halt, and when it’s finally over, they will look each other in the eyes, shake hands and smile. Months, years even, spent training, all for this single afternoon. Like the mayfly’s day of life, it’s all so condensed and brief, but for them, in the heat of moment, it’s worth it. It’s the only place for a series like this to end, with hard work, guts, and nirvana. What I’m talking about here is 1973’s original Aim for the Ace!. It’s the oldest anime series I’ve finished and, quite remarkably, it holds up. 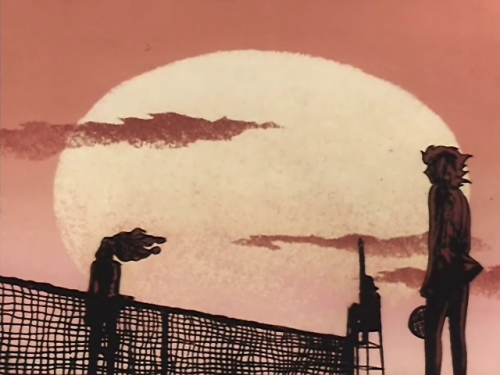 My only conclusion can be that it’s director, Osamu Dezaki, was the master. From The Rose of Versailles to Oniisama e…, I’ve barely scratched the surface of his oeuvre, yet the sheer depth of the man’s quality is something I’ve realised only recently. And in a time when I’m feeling particularly distanced from modern anime, Dezaki is there for me, map in hand, every other series another buried treasure.